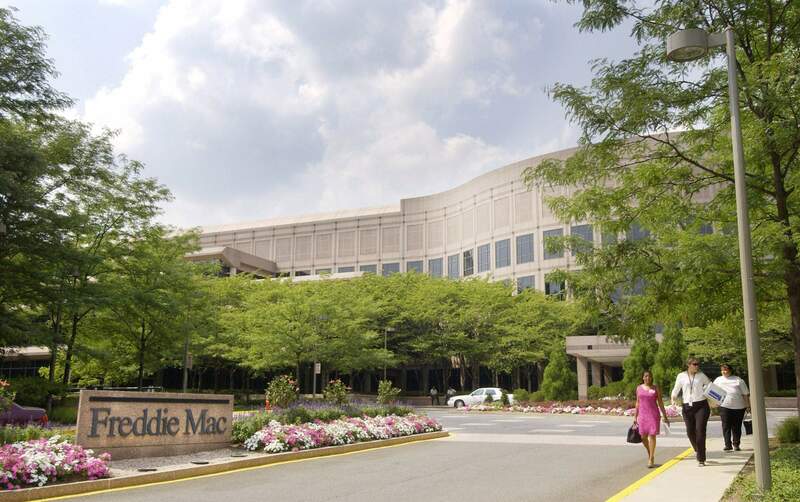 Freddie Mac headquarters are seen in McLean, Va.
NEW YORK – Mortgage rates retreated this week after weaker-than-expected employment data. According to the latest data released Thursday by Freddie Mac, the 30-year fixed-rate average slipped to 4.59 percent with an average 0.5 point. (Points are fees paid to a lender equal to 1 percent of the loan amount.) It was 4.6 percent a week ago and 3.9 percent a year ago. The 15-year fixed-rate average fell to 4.05 percent with an average 0.5 point. It was 4.08 percent a week ago and 3.90 percent a year ago. The five-year adjustable rate average dropped to 3.9 percent with an average 0.3 point. It was 3.93 percent a week ago and 3.14 percent a year ago. The U.S. economy added 157,000 jobs in July, which was slightly below the expectations of many economists. A slowing job rate can indicate the economy is ebbing. That concern was enough to push mortgage rates down a bit. “Mortgage rates fell slightly after an unexpectedly weak July jobs report, but are still above where they stood a month ago,” said Aaron Terrazas, senior economist at Zillow. Bankrate.com, which puts out a weekly mortgage rate trend index, found that more than half the experts it surveyed say rates will remain relatively stable in the coming week. Jim Sahnger, mortgage planner at C2 Financial, is one who predicts rates will hold steady. Meanwhile, mortgage applications were down, according to the latest data from the Mortgage Bankers Association. The market composite index – a measure of total loan application volume – decreased 3 percent from a week earlier. The refinance index fell 5 percent, while the purchase index dropped 2 percent. The refinance share of mortgage activity accounted for 36.6 percent of all applications. The MBA also released its mortgage credit availability index (MCAI) this week that showed credit availability increased in July. The MCAI rose 1.7 percent to 184.1 last month. An increase in the MCAI indicates that lending standards are loosening, while a decline signals that they are tightening.